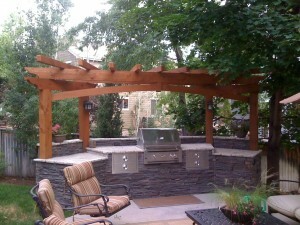 Outdoor kitchens add functionality to your outdoor space. Whether under a patio cover, in an outdoor room, under a pergola, or pool side – an outdoor kitchen creates a space for fun gatherings with family and friends. Let Craftsman Outdoor Living show you how an outdoor kitchen can be beautiful yet functional and rugged in order to withstand outdoor weather conditions. Our designs and material options blend innovation with traditional craftsmanship.